Cat owners are always in a dilemma whether they should feed their feline friends with dry food or wet food. But we will get in that debate in a little. The truth of the matter is, as long as you buy from a premium brand, both dry and wet foods are highly nutritious. So, who are those premium brands for cat food? And with that in mind, what is the best dry cat food? Today, we will talk about the difference between dry and wet cat food, but also about what to look for in a dry food. And of course, is there a right cat feeding method? Is dry food better than wet? Let’s get into the heated debate right over. There is no right or wrong answer to this question. Both sides have strong opinions. To be fair, if you believe dry food is better, nobody will be able to persuade you that wet food can work better for your cat. As we mentioned in the beginning, if you are buying from a premium brand, both types of food are nutritionally very similar. The biggest difference is that dry food does not provide the same amount of moisture. At the end of the day, it comes down to preference, and you can always combine both. There are two main concerns when it comes to dry food. The first one is dehydration. Prey consumed by wild cats is about 70% water, and canned wet food averages between 70 and 80 percent water. Dry food, on the other hand, is just 10% water. Cats that consume solely dry foods can get dehydrated if they do not get enough water. Purina, one of the best brands when it comes to cat foods, suggest your cat needs to drink one cup of water for every ten pounds of body weight in 24-hour period if she is on dry cat food diet. When the weather is dry, your cat needs even more water. If you feed your cat with dry food, provide clean and appealing source of fresh water at all times. Pet water fountains are always a good idea. The second concern is regarding obesity. So far, data has shown that cats that consume solely dry food are more prone to obesity and diabetes. The main reason is that dry food is higher on carbs, and part is because dry food usually means free-choice feeding. You can prevent this by rationing the dry food rather than serving it all-you-can-eat-buffet to your cat. So, the question is, is wet food better? Well, of course not necessarily. 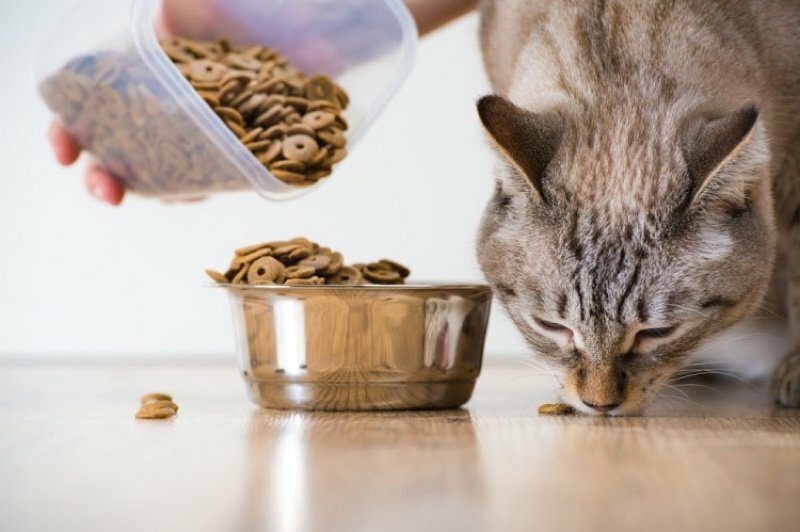 If you buy cheaply produced wet food (which often is the case with owners), your cat is not getting nearly as nutritious food as with dry food. Check the ingredients, and you will see most cheap and even moderate priced wet foods do not contain as much animal protein sources as dry food. Some owners also like to go the raw food diet path. This is completely natural and mimics the wild diet of a cat. In other words, your cat is getting mostly fresh and unprocessed meat and organs. The raw food diet movement has exploded in popularity recently. And it is understandable. But the limit here is time. As in, you do not have enough time to work and provide raw food diet for your cat. Not to mention, it is much more expensive. What to look for in dry cat food? When it comes to dry food, there are good options and bad options. Same as with cheap wet food, cheap and low quality dry food contains fillers, artificial preservatives, and other things that you do not want your cat to consume. Speaking of protein sources, many cat food brands market their food as high protein formula. But you need to look at the products that are the source for protein, like lamb, chicken, salmon, etc… And bonus points for listing specific organs as well. Do not buy foods that claim they have high protein source, but sourced from “by-product meats”. Just to be clear, by-product meats are poorer quality than regular meat sources. They are not bad, but they are not the high quality you want. Look the first three ingredients. They are listed in order of weight, from highest to lowest. If the first three are animal meat, boneless meat, or organs, you have a good product right there. Bad ingredients are basically anything that is cheap. Usually, they are unhealthy ingredients that are also bad for the environment. How to test the food? When you are buying new best dry cat food, you want to make sure it is appropriate for your feline friend. And at the end of the day, it is all about digestibility. Food is tricky, just because you can eat, it doesn’t mean your body will be able to digest and absorb it properly. How can you tell if the food is digestible? Well, whatever is not absorbed is excreted. If that is the case, you need better food. There are three general cat feeding methods. Each has its own advantages and disadvantages. It is up to you to choose one that works best for you and your cat, no matter which best dry cat food you choose. One is meal feeding method, which means you are serving meals at specific times during the day. Food intake can be closely monitored, and you can easily spot any change in appetite. However, the downside is your cat might beg for food between meals, and it can get challenging to resist. Another downside is that you have to be at home during those meal times. The second method is free feeding, which means you leave food available for your cat at all times. Unlike dogs, cats will not overeat. They eat as much as they need to satisfy their hunger, and can leave food in the plate. She eats on her own schedule. The downside is this method often leads to obesity and overeating. And you cannot tell if your cat’s appetite has changed. Last, but not least, we have combination method, which means two daily meal times, and dry food freely available. The BLUE high protein food contains one of the highest percentages of protein. 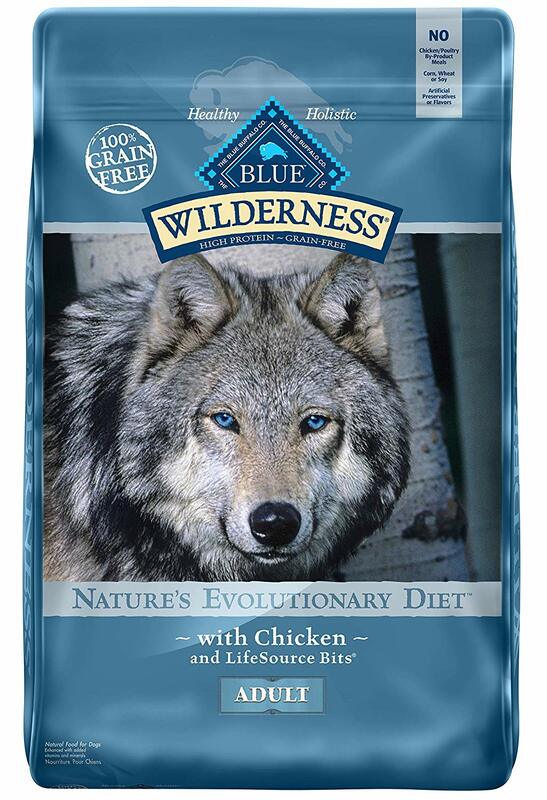 Anything over 30% is great, and BLUE goes up to 38% of protein content in this dry food. 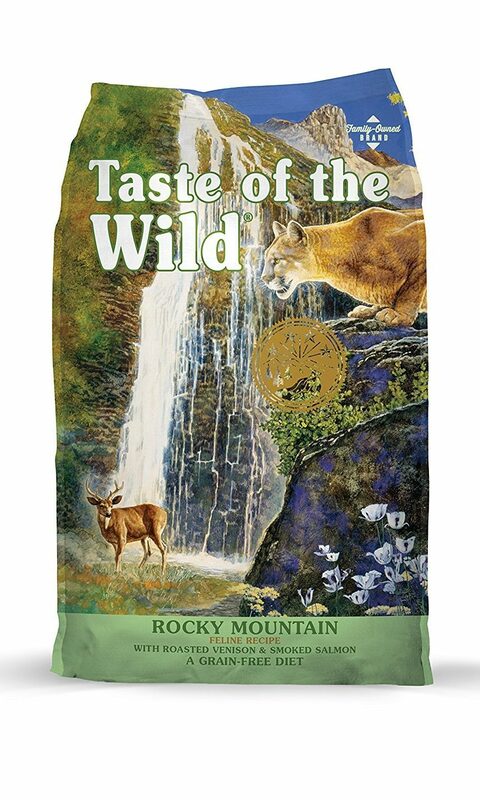 The food is delicious, your cat will love it, and it comes packed without any grains. It is an absolute stand out. Another benefit is the process of manufacture. The company uses the “cold-formed” method, which is a process that avoids excess heat. This ensures that the ingredients in the food do not lose their nutritional value. The protein content comes from natural and real chicken meat, and not any by-product meats. No artificial coloring, no artificial flavoring, or anything else. The label clearly lists all of the sources of protein and other ingredients, so can sleep tight knowing your cat is eating healthy food. One downside is high calorie content. The food was inspired by the diet of the lynx, so a predator like that needs a lot of food. You look at the label and ingredients list, and you know you are getting a good product. The first two ingredients are de-boned chicken and turkey meat. Those are real, readable, and healthy ingredients right off the bat. This food contains all of the five key indicators for a healthy diet: essential vitamins, minerals, probiotics, fiber, healthy protein, and fatty acids. As with most premium best dry cat food options, this one comes without any grains, and with a high focus on protein. 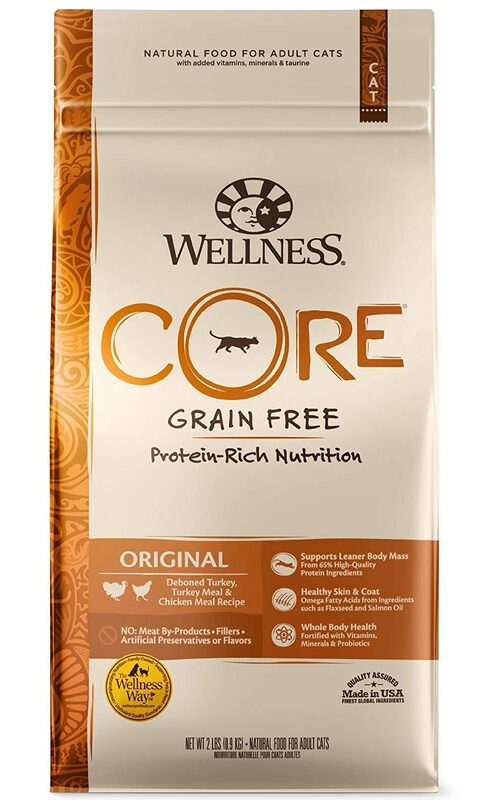 The protein content is at 45%, making it extremely nutritious for your feline friend. There is no wheat, corn, soy, or any similar artificial products. Most notably, the product is made in the USA. 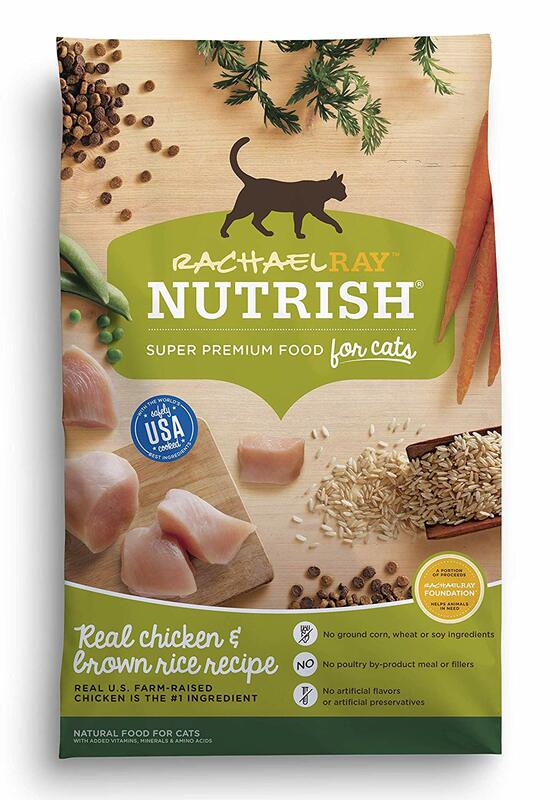 Yes, Rachel Ray now cooks for your cat as well. You do not usually expect a celebrity chef to have his own line of pet food, but Rachel Ray is not an ordinary celebrity. This dry cat food is quite popular among pet owners. Whether that is the celebrity pull in, or the food is just too good? We want to believe it is the latter. With an absence of cereal grains and real chicken as the No.1 ingredient, you know it is a quality product. This food will ensure you can be confident regarding any pet allergies. The food contains 34% protein, which is on the lower side, but there are also 14% good fats. In addition, the food is enriched with minerals like calcium, zinc, and phosphorus. 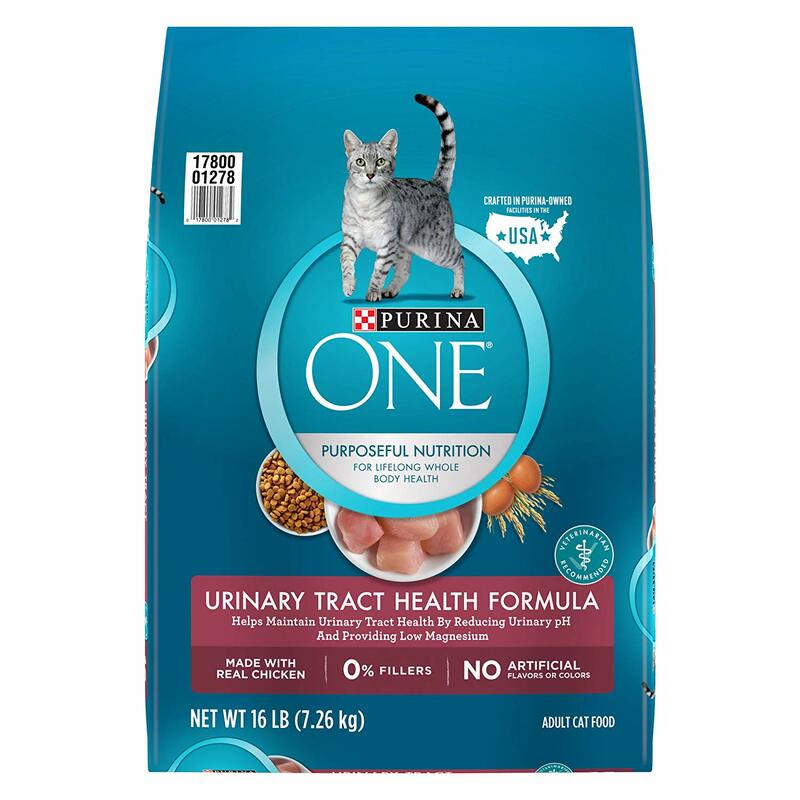 Originally, this food is designed for cats who have urinary tract issues. But even without the UTIs, the food is quite good for adult cats. Designed to maintain the urinary tract healthy by reducing urinary pH and providing low magnesium content. The food is made with real chicken and has an easily digestible formula in general. Not suitable for kittens. With some healthy omega-6 fatty acids, the food also boosts the look of your cat’s coat. Purina is a well-known and respected brand in the world of cats, so you know you are getting a quality product. And with such a high rating on Amazon, one that has been tested and tried by many cat owners. If you want more fish content in your food, this is the one to go for. In addition to real animal protein sources like venison and chicken, this food also contains trout and salmon. Because of that, the food is rich in healthy fatty acids. A highly digestible food, you also get healthy carbs sourced from fruits like raspberries, blueberries, and peas. The protein content is incredibly high at 42%, and there are is corn, wheat, grain, or any other filler in the formula. This is another food that was made in the USA. You can say that the only negative is that your cat will love it to the point she will eat too much of it.